In preparation for winter, remove dead plants, leaves, fruit (mummies) and flowers from garden beds. Many insects and diseases overwinter in fallen debris. Do not compost any plant materials you think might be diseased. Prune your evergreen trees and shrubs now and use the cuttings for holiday wreaths. 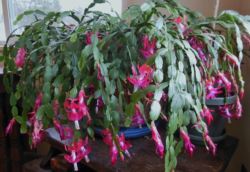 Christmas cactus, poinsettias, cyclamen, kalanchoe, amaryllis and more help make the house look festive at this time of year. They prefer cool temperatures, so find a place for them away from a heating vent. To avoid over watering, check the soil and give them water only when dry. Consider a living Christmas tree that can later be planted in your garden. A smaller tree doesn’t have room for as many ornaments, but is more likely to adapt well when planted outdoors. You can even rent a tree from Our City Forest as it's on its way to a permanent home in the community. You can bring some of the beauty of your garden inside to decorate your home for the holidays. Consider some of these seasonal items for tree ornaments, mantle decorations, garlands, and wreaths: laurel leaves, lemons, pine cones, nuts, pyracantha berries, eucalyptus pods, grape vines, rosemary, and rose hips. 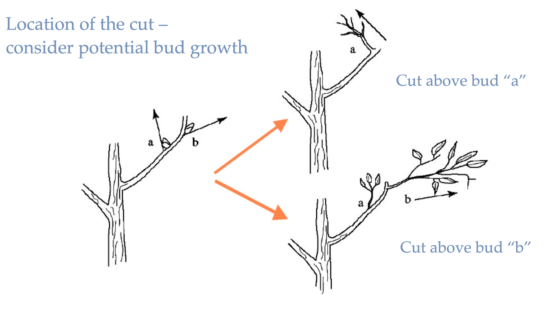 Little or no pruning is required during the first year after planting. Blackberries should be pruned as soon as the harvest is completed. All wood that has produced the current crop should be removed. The canes should be trellised immediately after pruning. Put up only the larger canes and prune the small ones. Generally, no more than 9 canes should be put up on the trellis. A fan-like arrangement is the best way to trellis the vines. Tipping (removing the end of the canes) forces out the laterals on which fruits will be borne the following season. Consult our Berries page for more information. If you've had major pest infestations on your fruit trees this year, now is a good time to use dormant oil sprays. These are used to reduce overwintering populations of insects. They work by smothering soft-bodied insects and eggs when applied at the proper times in the life cycles of the pests. See our Fruit Tree and Vine Care Calendar for more information. Poinsettias are a tropical plant so they'll do best in a warm sunny place in your house. The soil can easily dry out and become hydrophobic, so make sure to check the soil moisture regularly. There’s really no need to fuss over them if you’re only keeping them for a few weeks of holiday color. If you want them to bloom again next year, UC has Poinsettia Care Tips that describes what to do. Poinsettias are beautiful at this time of year due to being forced in commercial greenhouses. If you want to save yours for next year, you will also need to take measures to force bloom in time for the holidays (it's a little tricky, but here's how if you're interested). Did you know that the red parts are actually bracts (modified leaves) and that the true flowers are the little yellow parts in the centers? You can also plant them outdoors with protection from frost. They have been seen growing as tall as eight feet in San Jose, and taller in their native Mexico. The showy red Amaryllis (more correctly called Hippeastrum) is a great bulb for growing indoors if you can’t wait for your outdoor bulbs to bloom in spring. Choose a pot just slightly larger than the bulb. Plant it in loose potting soil with a third of the bulb sticking up above the soil surface. Keep moist, but not so wet as to rot the bulb. The University of Minnesota Extension has information on general care and how to control blooming. Mistletoe is a parasitic plant that reduces the vigor of the host tree and can threaten its survival, especially if it's drought weakened. Cut off affected limb 18" or more below mistletoe attachment. If this isn't possible, remove mistletoe and wrap the infected area with black plastic to kill any resprouting. More information about this plant is in the UC Pest Note on Mistletoe. This fungal infection, Armillaria Mellea, also known as mushroom root rot, honey fungus and shoestring fungus can cause foliage to become sparse and eventually kill the tree. The white or cream-colored fungus will grow between bark and wood of roots and up into the lower part of the tree trunk. It smells like your typical grocery store mushroom. In spring or fall there may be mushrooms growing around the base of the infected tree. If the disease has not progressed too far, you can cut out infected tissue and expose the base of the tree and roots to air. Reduce watering especially close to trunk. No chemical treatment is known to be effective. Plants Resistant or Susceptible to Armillaria mellea, The Oak Root Fungus by Robert D. Raabe contains more detailed information. The UC Master Gardener video Revealing Root Rot can help with detection of two common root pathogens and provide guidance on how to reduce the spread. This pest can cause damage to California pepper trees. The damage is done when the insect is in its immature stage. They make doughnut-like pits on leaves that wrinkle or twist the leaves as well. Parasitic wasps can provide satisfactory control. See the UC Pest Note on Psyllids for more information.